Here's a little story about some innovation soon to show up in Copenhagen. In a city with many busstops and cycle tracks, there is the question of coexistence. 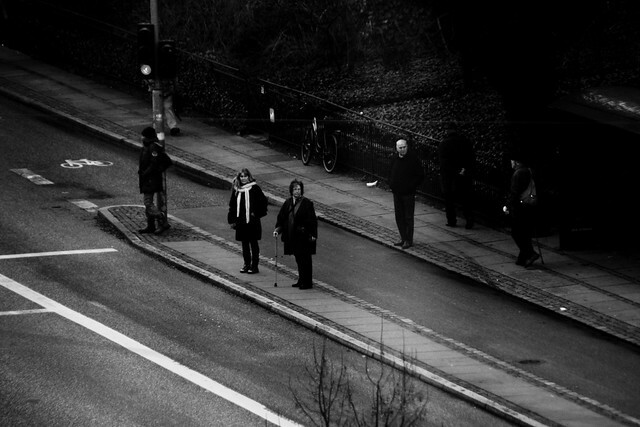 For a number of years, the City of Copenhagen has worked hard to establish islands at busstops for the bus passengers to use when disembarking. It really is the baseline for infrastructure and the City, by and large, prefers it over anything else. Since the City starting retrofitting busstops to provide islands, safety has increased dramatically across the city. In 2015, The City of Copenhagen will establish LED bus islands at certain locations where there isn't space to build a proper island. When there is no bus, there will be a green strip along the curb. When a bus rolls up, the LED light show will expand across the cycle track to indicate to all traffic users that passengers have the priority. When the bus leaves, the LED lights revert to the green strip. The Mayor for Traffic and Environment, Morten Kabell, said, "We know that tradtional bus islands are a good idea but don't have space everywhere for them because some streets are too narrow." "Therefore it will be exciting to see that if a lighted busstop can create a better sense of safety for both parties, create a better flow on the cycle track and create space for bus passengers". The pilot project will start next year, with a budget of $400,000. This is an example of a standard bus island. The cycle track continues between the sidewalk and the island. In this instance, the law dictates that passengers have to wait for the cyclists to pass before crossing to or from the island. There are, however, a number of locations where space is limited. This kind of situation will be perfect for the new pilot project. In locations like this, the law dicates that the bicycle users have to stop to allow the passengers to board and disembark the bus. 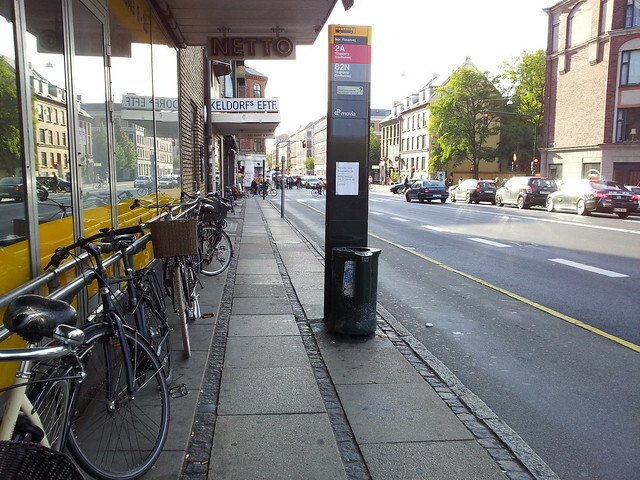 Generally, in detailed observations that Copenhagenize Design Co. have done, there is not a lot of drama at busstops. Things do get a bit tight in the rush hour, sometimes a bicycle user and a bus passenger will bump into each other. Generally, this LED solution will clearly mark out the territory for all parties involved. Many people aren't clear about the rules - or the fact that they differ between places with an island or without. This solution is a positive addition to the traffic equation in Copenhagen.